This LP contains both the 1970 Hope College premiere, performed by a 14-piece ensemble, and a 1977 recording from Wesleyan University, performed by a 43-piece orchestra. Roaratorio is proud to present the first commercially available release of this eerie, beautiful, and important Oliveros work. Cover artwork by Judith Lindbloom. Download coupon included.“Shortly after it was published in 1968 the SCUM Manifesto by Valerie Solanas fell into my hands. Intrigued by the egalitarian feminist principles set forth in the Manifesto, I wanted to incorporate them in the structure of a new piece that I was composing. The women’s movement was surfacing and I felt the need to express my resonance with this energy. Marilyn Monroe had taken her own life. Valerie Solanas had attempted to take the life of Andy Warhol. Both women seemed to be desperate and caught in the traps of inequality: Monroe needed to be recognized for her talent as an actress. Solanas wished to be supported for her own creative work. Commissioned by the Music Department of Hope College, Holland Michigan, To Valerie Solanas and Marilyn Monroe in Recognition of Their Desperation had its premiere in 1970. Though everyone knew Marilyn Monroe hardly anyone recognized Valerie Solanas or took her Manifesto seriously. 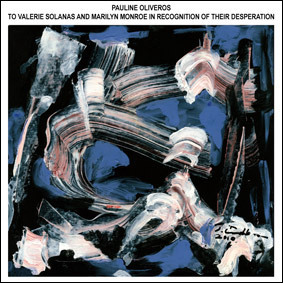 I brought the names of these two women together in the title of the piece to draw attention to their inequality and to dedicate the piece.” – Pauline Oliveros.